This document has been prepared for information purposes for guests of the Hotel Villa La Pierre and may not be distributed to the public. The images used in the study are the property portals and authors, they may not be copied or distributed. Development on the basis of: travel portals, blogs, website Municipalities Strzegom, Dobromierz, Świebodzice, Audit Tourist, own materials and Plan for village renewal Olszany 2008- 2015. In the commune Strzegom no forms of nature such as parks, nature reserves and areas of protected landscape .Nie mean, however, that the municipality is deprived of places of interest in terms of landscape, nature and interesting historical and architectural monuments. Strzegom Municipality geographically is part of Sudeten Foreland, so it is characterized by a picturesque, hilly landscape with a dominating one side of the city of Mountain of the Cross (the highest peak Hills Strzegomskie) and river valleys Strzegomka and Pełcznica. Tourist attraction is the beautiful view of the panorama from the viewing platform at the top of the Cross Mountain (354 m asl). Moreover, in the forest complex Krzyżowa Mountain there are many walking paths and a quarry on the western side constitutes a unique attraction. This beautiful, picturesque landscape delight every stroller. “On our Top” is the path of natural education, which the route has 1300 m. The path starts at the foot of the mountain of the cross – one of the most picturesque places of the municipality of St. Petersburg. Create a path was made possible by the commitment of the municipal office in Strzegom and Jawor Forestry. To visit the path encourages visible from afar the colored witacz. Before entering the route it is worth first of all read the rules, which contains guidelines for conduct on the trail. On the first of the boards you can get acquainted with the history of the mountain of the cross and read what the protected plant species occur on its slopes. Strolling along the trail, we face the next arrays-with a list of risks of the forest, selecting its presence by animals, amphibians and reptiles, and birds. Another interesting, and one of the last, an array is that which contains the description of the floors in the forest and fauna characteristic for each of them. Visitors to the path won’t get lost. The road show because the characters in the selected direction. Exhausted walkers can rest in the shade of trees with specially prepared bench-tables, and use the Firebox. 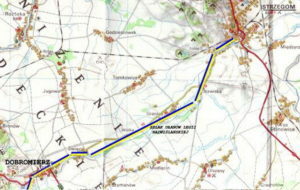 The route comes to an end at the pumping station strzegomski of the establishment of water supply and sewage system. Briefly, let us introduce the natural features of the Top of the cross. It is the highest peak of the hills of Strzegomskich, which grew out of a steep rocks surmounted by a cone to the East of the Mountains. Jerzy, towering above the city. Top of the cross is built with młodopalezoicznych granodiorytów, which on the top broke mioceńskie bazalty that make up the volcanic chimney with dajkami. Grow in the form of rocks with irregular shapes. In the rocks surrounding the Summit occurs a number of sometimes rare minerals, mineral m.in. analcyn, aragonite, bol, calcite, AeroLite, chalcedony, opal in the form hialitu, trydymiet, nontronit, Peridot, pinitoid, argot, natrolite and phillipsyt. In connection with complex geology at the top of the cross has a very valuable team rock vegetation and thermophilic, especially for bazaltach, which in addition to the peaks they form on the slopes of the heaps rumoszu. Grow on them, m.in. Paronychia Paronychia Paronychia, North rock wall lizard, polypodium vulgare, paprotnika fragile. In the grasslands suchoroślowych, m.in. m. orzęsiona, chrysanthemum baldachowaty, Festuca pale, Veronica hilly, oman rough cinquefoil, erect, yarrow, pink kartuzem, Campanula latifolia, and thymus vulgaris. There are also rare wątrobowiec and growth. The slopes are covered with forests of the river is rich in species composition. There are, m.in. -old petiole Oaks and bezszypułkowe, graby, beeches, limes and szerokolistne, clones of the ordinary. In the peak and podszczycie occurs m.in. cotoneaster integerrimus-forming the largest concentration, wild rose, Rosa rubiginosa, Ligustrum vulgare or Crataegus monogyna. Many of these specimens, we can see yourself while walking the route path exploration. On the journey you can visit at any time of the year, to trace the changes that occur in nature. Spring delight us green cereals and fiefs blueberries. In the summer, we will listen to the buzzing of insects, and the autumn will greet us ferią colors that adorn trees and shrubs. In the winter, in turn, are the image wrapped in white snow and embrace us tranquility, that so much is missing to the residents of the city. We invite you all to walk after our top! DESCRIPTION of the trail, from lowland, length of the route is 22 km (about 2 hours walk), a route rich in scenic landscape with little traffic. The trail commemorating the former concentration camp prisoners “Gross Rosen” begins in Jawor-through Market, along the Tower after her death until the hospital, leading to the border of the city. Going along the road, we come to the Zębowic and then by going through the NISA bridge Crazy, we come to the Paszowic. After a few hundred meters we reach the road of Bolkowice, Paszowice-in accordance with the route cross the bridge on the Nysa Rampant and we go to the village of Czernica. We come to the main road, we cut it and ok. 250 meters turn to the right; dirt road, we come to the Sycamore-Roztoka. We go along ok. 100 m, then turn left and by field come to the quarry in Gniewkowo, which is flooded with water and forms a picturesque lake. From the cliffs you can see panoramic views. Next the trail runs through the forest, until the road Zimnik-Kostrza, then leads along the little stream, then arc to the left leads to a small clearing with the remnants of concrete buildings. The area is owned by the Museum of the former concentration camp Gross Rosen; You should go along the fence of the former camp kontrakcyjnego to the correct entry. Camp Gross-Rosen was formed in August 1940 as a subsidiary of Sachsenhausen, where prisoners were destined to work in the local quarry. The first transport arrived there on August 2, 1940. 1 May 1941 Arbeitslager Gross-Rosen was an independent concentration camp. In total, by Gross-Rosen (the home camp and its subsidiaries) over approximately 125 000 prisoners. The estimated number of victims of camp Gross-Rosen is approximately 40 000. One of the most tragic periods in the history of this camp was his evacuation. When the transports (even several weeks) killed many thousands of prisoners. From autumn 1943 to February 1945 worked in KL Gross-Rosen camp work of Wrocław gestapo (AEL), through which more than 4 200 prisoners. Hills, among them Goose Mountain and Sieraków. Traversing the fields and meadows between the villages Wieśnica and Żółkiewka. we come to Wolf Rocks lying at the foot of Saint George and the top of the cross. Exhausted wędrówkowicze can relax in the shade of the trees, on the benches are located at the foot of two mountains. The route continues alongside the pumping Plant Strzegomski CCI, the streets: Promenade, t. Kosciuszko. Anna, ending its run on al. Polish troops with the viaduct and the former RAILWAY station in Strzegom. DESCRIPTION of the bike trail, with a length of 50 km, around 5 hours, easy hike and rich in scenic and cultural values, runs after lowland territories Of the earliest form of low traffic. Easy hike and yet rich in scenic and cultural values, runs after lowland territories Of highest proportion, mainly bitumen roads with little traffic, and therefore does not require a lot of health and professional equipment. Start takes on the Witoszówka in Świdnica, where the streets of the country road and Kochanowski we leave in the direction of Witoszowa. Through Witoszów on the left side of the road we pass the private Museum of weapons and Military, in which collections are, among others, fighting vehicles, aircraft and small arms. A few hundred yards away at the crossroads turn right and go towards the Cell, crossing the road a busy national road No. 35. In komorów we can admire the ruins a windmill, the old Bell Tower, which is the Memorial to the fallen in World War I the inhabitants of the village and over a small lagoon we can do a short rest. After passing the Bay we go all the time an asphalt road by Tamworth and Witków to Old Javorová, after which we turn left and we get to the fields. 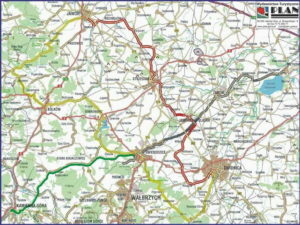 “Coal Road” (on the short stretch runs parallel with route K-3), which brings us to the asphalt road connecting Bolesławice and on November 1, the Silesian. Here we turn left and we arrive to Jaworzyna Śląska, a large railway junction, where the cross railway lines from Jelenia Gora to Wroclaw and Legnica to Kamenz, Ząbkowickiego. In we can visit the very interesting Museum of industry and Railways on Silesia, which is housed in the historic Roundhouse. Out of town we leave the streets of freedom and Brick, drive through the railway connection Jaworzyna Śląska railway-Herdsmen, we pass the allotments and the dirt road we follow in the direction of Pasiecznej. Here we enter on an asphalt road, you arrive to the municipality of St. Petersburg. The best preserved fragments are located on the West side in the City Park of the tower to prevent airframe damage. In 2009, the Park erected a monument there Duchess Anna, which gave the city of Myrtle Beach municipal rights, and in 2011 to use attractively refurbished city park. The minor Basilica Church. . St. Peter and St. Paul is one of the largest and most beautiful Gothic buildings in Lower Silesia. The construction of the temple started 1253. during the reign of Prince Władysław, and ended only in the mid-15th century. The Church was built on a Latin cross plan with granite and basalt rubble and bricks, okładanych sandstone. In 2012 the Basilica received the title of historical monument. The Gothic church of Saint Barbara, built before the end of the 14th century. City Hall along with the Market, as the only medieval building fragment the market. With strzegomski we Market driven by ul. T. Kościuszki where: Church and monastery of pokarmelitański, the original building dates from 1430. rebuilt by the Carmelites in 1729, and then by the Evangelicals in 1819. In 1997, the Church was taken over by the Catholics and dedicated to the Church. Of the most Holy saviour of the world and our Lady of the Scapular. Currently in the renovated walls of the monastery of pokarmelitańskiego is a centre of social activity “caramel”. Next to the Church. Of the most Holy saviour of the world and of our Lady of scapular begins built with granite crosses, way of the cross, which ends at the foot of the cross. However, if you want to stick to the trail there is taking us away from t. Kościuszki Street and go in the direction of the road on Sycamore to after passing the last buildings of the Strzegom turn right and “polniakiem” to reach the asphalt road, which by the Limit will lead us to Goczałkowa. Along the way, passing through on railway line Legnica-Kamieniec Ząbkowicki, we pass to the left of mine rock raw materials (note the truck). Once you reach the Top Goczałkowa we can admire the Palace, where the first mentioned of 1615. The current nature of the Palace owes two reconstructions: the first thorough in at the turn of the 18th/19th century. and in 1889. Around the Palace is surrounded by a park and serves as a residential building. Leaving Goczałkowa, we turn left and we are going to Goczałkowa, the village, which is surrounded by the river Wierzbiak and 19th century English park. Leaving Goczałków, we leave also the municipality of Strzegom. Going further by Targoszyn we get to Mściwojowa. From Mściwojowa we go in the direction of Zębowic again the railway line crossing the Legnica-Kamieniec Ząbkowicki, and then the way the County 374. Once you reach the Zębowic turn right and go in the direction of Jawor. Mileage: Strzegom-Stawiska-Limit-Small Modlęcin-Serwinów-Dobromierz-Chwaliszów-Tisza castle ruins-Struga-Szczawno Zdrój – Podzamcze-Ksiaz Castle-Wałbrzych-reserve “Lake Daisy” – Witoszów Górny-Witoszów Dolny-Świdnica. Interesting, though not exactly appreciated trail that virtually all its length runs when lands of the Duchy of Świdnica-Jawor. The walking mountain trail, long. 53 km, marked in a manner reflecting the yellow-blue-yellow colors of your leisure, the uniformed cavalry. The formation of this was called the first Danube Legion or the Legion. The titre of the Legion of the Vistula appeared later. Runs from the Strzegom to the Świdnica. Trace it in 1960. in a branch of PTTK “to commemorate the March of kilkusetosobowego branch of the Polish Lancers, who during the Napoleonic wars, they set out from Naples to help the troops of the French Emperor in the fight against Prussia. The formation of this was called the first Danube Legion or the Legion of Poland, later the Legion of Vistula. 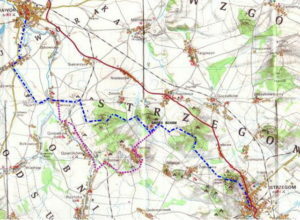 This route also recalls the first victorious after grey and very spectacular, battle of the Polish formation with the Prussians. In the boxes above the gmina (Red Hill 458 m) on 15 may 1807. heroic Lancers played first after most victorious battle Poles with the Prussians; It was the great importance of propaganda. While the French army of General Lefebvre developed patterns of combat in front of the Prussian troops, the Polish uhlans, sentient beings of the Hill, that surprised the enemy, breaking up its strength in the fluff. The victory was so sudden and devastating, that only a few the Prussians managed to escape in the forests of Chełmca and return to the fortress of srebrnogórskiej, where they went to the French. In the battle were killed more than 600 soldiers of Prussian, a further 300 were captured. Loss of Polish uhlans 7 killed and 15 wounded. At the site of the battle on the Red Hill, set in 1960. the modest monument – today unfortunately for unknown reasons a bit forgotten. The same historical trail, connecting the Strzegom, Dobromierz, Strugę, Cisy, Książ Castle and Świdnicę, is a bit sloppy, losing places the readability. Starting a trip from Strzegom, al. Polish Army (in the same place ends blue trail-the trail of the martyrs) and disused railway stations already, go down the street past the Strzegomską Basilica: Dabrowski, the chapel of Saint Anthony, the Church of Saint Barbara and the City Hall with very well preserved Tower of the municipal market, a market we turn left, down the street to the ghetto heroes, along the newly redesigned the City Park and the ramparts of the pass closed the railway viaduct and entering into settlements Graby. Along the river Strzegomki along the lower we go about 1 km and crosses the River on a bridge, by going to the street Edge, from there go straight to the picturesquely located village, Stawiska, boundary and Modlęcin. The impressive bridges crossing the River in several places, we can admire flora and fauna living in this particular climate. It encourages walkers to frequent trips and rest on benches mounted along the street front. The object of worth seeing is the first school, built after the war in 1946, on the street, Jelenia Gora. Around the school there is a beautiful park and a playground. You can also deviate from the trail and watch the huge quarries, bound for the village of Żółkiewka or Tomkowice, which form a unique tourist attraction. Going towards Stawisk Street Wałbrzyską on the right side it is worth watch the ruins of one of the larger industrial plants in Strzegom-“Konpar” producing I used flax fibres and hemp seeds. In the municipality of almost all of the Trail runs along the river. Strzegomka is the largest tributary of the Bystrica. Wandering along the river we can see Hills Strzegomskie cultural with the walls of the quarry, which is one of the municipalities of St. Petersburg. Leaving from the Strzegom crosses the national road No 5 and we enter the village Stawiska. From this place we can look again in the city, to see from afar a ruin for Mill Hill, commonly called Bastion, and which represent a remnant of the Fort and Dutch windmill powder from the 18th century. In Border we can stop for a moment and admire the romantic Palace lies on the main road. This is the Foundation of duplex, built on a quadrilateral with a small turret in the North-East corner. The indoor Palace is a hipped Gable. All around there is a beautiful park with a small pond. It is privately owned. Leaving the border follow the signs towards Dobromierza, we pass along the way village Modlęcin, which also lies within the administrative borders of the municipality Strzegom. Leaving Dobromierz, we, inter alia, in the direction of Szczawno Zdrój, Książ Castle and we finish our journey in Świdnica. Description: the Route runs mostly pogórzami by the beautiful grounds of the Lower Silesia region. Not formally belong to lowland trails. Starts at the foothills of Kaczawskim, at the foot of basalt cone top Grodziec, where is originating from the 15th century. Grodziec Castle and Gothic church. Next the trail leads through Wleń, Bolczów from the ruins of the Castle from the 11th century, Płoninę from the ruins of the Castle from the 15th century Niesytno. and the Renaissance Court of the 16th century, the Piast Dukes Castle of Bolków Pain- of the 13th century, Świny from the ruins of the Castle from the 12th century. Tisza Castle built at the end of the 13th century, to Duke, where is located the largest castle complex in Upper Silesia, built at the end of the 13th century. by Duke Bolko I. 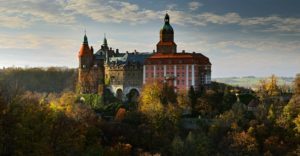 The castle was built after the year 1288 the Duke of Świdnica-Jawor, Bolko I and in the 16th century Konrad II Hochberg expanded Castle in the Renaissance style and founded the castle gardens. The last owner of Duke, Hans Heinrich XVII. At this time the expansion of the Castle residence. Near is founded a branch of the Gross-Rosen concentration camp, and the prisoners were digging a tunnel under the Castle as part of a huge complex of RIESE. After 1945, the residence is the Red Army, then abandoned. The first renovations began in 1971, and in 1989 became the property of the city of Wałbrzych. Currently is home to numerous cultural institutions, museums, art galleries. Work in the restaurants and hotel. Is available for exploring and attracts crowds of tourists. This huge complex is the third largest castle in Poland and one of the most important Silesian historical monuments. In addition to the Castle you can see the beautiful park with an amphitheatre, scenic sites and mausoleum of the Hochberg family, also in the Park is the historic horse with its new design, and the most beautiful view on the property extends from the rock giant. Gmina książ Wielki complex consists of two hollow workings under the Castle from various sites. Tunnels are mostly finished with the construction of a reinforced concrete slab and preserved in good condition. The total length of the excavation is 950 m, area 3200m2 and 13000m3 volume. Is available to explore only partially, most of the underworld is the Institute of Seismology. Subscribe and stay tuned for updates!